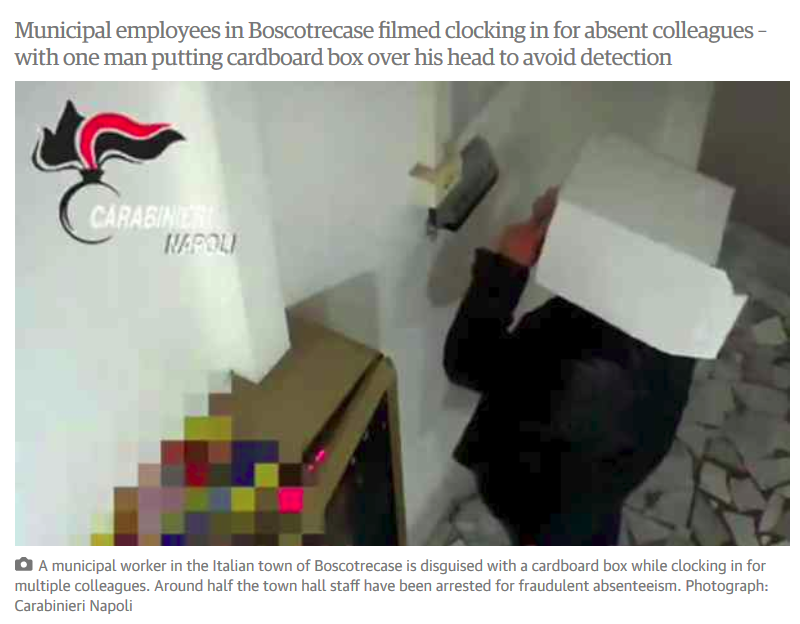 Roughly half the municipal employees in Boscotrecase, Italy (population 11,000) have been arrested for fraud. The employees clock in, sometimes for each other (with boxes over their heads), but don’t show up for work. The arrested are accused of fraud against the state. As a result, there are not enough people to run the town. Services are shut down. Please consider Not Enough Staff to Run Italian Town after Arrests for Bunking Off Work. The mayor of a small town outside Naples had to shut down most municipal offices after police arrested 23 of his staff in the latest revelations of absenteeism in Italy’s public sector. Staff were filmed clocking in and then leaving to go about their personal business or using multiple swipe cards to register absent colleagues, police said, in scenes that have become familiar after numerous similar scandals. A police video showed one man trying to tamper with a security camera and then putting a cardboard box over his head to hide his identity before swiping two cards. Police arrested around half of all employees in the town hall offices of Boscotrecase following a weeks-long investigation that they said revealed 200 cases of absenteeism involving 30 people. “I’ll probably have to shut down the town hall,” Pietro Carotenuto, elected a month ago as mayor of the town of 11,000 people, told Sky Italia. Those arrested, accused of fraud against the state, included the head of the local traffic police and the head of the town’s accounting department.